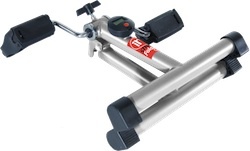 Similar to the Stamina 15-0120 InStride Cycle XL but lighter. As an added bonus this one will FOLD up so you can slide it under the couch and out of the way when you aren’t using it. Watch the VIDEO below for a detailed demonstration. A great little machine to pedal away unwanted calories, help keep the knee and shoulder joints loose as well as strengthen and tone muscles in the legs or arms. Definitely made to be portable because it does fold and only weighs 6.2 lbs. In keeping with Stamina’s quality the frame is made of durable tubular steel and will withstand a lot of abuse. This makes it the perfect travelling cardio machine for your suitcase. Use it anywhere; hotels, motels, diner stops, on the airplane etc. This folding cycle is most commonly used at home and in the office. Sitting in your favourite chair you can pedal away. Answer your emails, watching your TV, talking on the phone, or reading a book. The Stamina InStride Folding Cycles’ components include rubber feet to keep it from sliding and slipping on most surfaces. The straps on the pedals are Velcro and easily adjust to any foot. You don’t have to use the straps to operate the pedals but if you do use them you get the benefit of working your legs in the front and back because of the “push & pull” advantage of using straps. The pedals themselves are solid and weighted, and are made so you can use them forward and backward. On the floor in front of your chair you simply pedal with your feet. 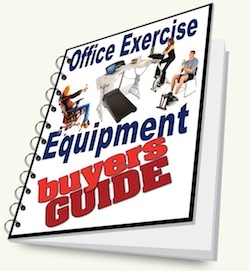 To use your arms set the unit on top of a desk or table and use it as a hand cycle. The electronic monitor that comes with the machine is an added bonus and will time your workout. Turning on automatically when you begin to pedal and then off a couple minutes after you stop. This way you can time your exercise to get more benefit to your arms, legs, back, and even your core if you sit up straight while you pedal. This pedal exerciser comes mostly assembled so it’s almost ready to go right out of the box. The resistance is set by simply tightening a friction screw to the desired amount. Keep in mind that this is a lightweight machine and not intended to be a heavy duty exercise machine. Whether you use the cycle to burn off extra calories or to help combat Sitting Disease, you can benefit from using it just about anywhere. Maybe you are recovering from knee surgery, have arthritis, or can’t move around outside like you used to. Many rehabilitation offices are using and prescribing mini pedal exercisers to their patients. 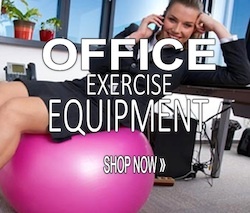 Even an avid gym goer can benefit from additional movement during the workday. With this easy to store unit a person can keep it under their desk and use it intermittently throughout the day. Regular movement doesn’t just improve heart health and strengthen and tone muscles. Using this can help with bone strength, lower bad cholesterol, and increase the good cholesterol. Pedalling is an exercise that will also improve lung function and increase metabolism, as well as improve digestion. All this can quickly add up to weight loss and reaching and maintaining fitness goals. Can’t beat the price for what you are getting. Heavy duty tubing and quality main frame. Adjustable foot straps made of Velcro so they are easy to use. Can be used with or without the foot straps. Rubber non-slip feet for most any surface. Easily adjustable tension control knob, made with a ‘T’ handle for arthritic hands. Folds up nicely to easily store away or slip under the couch. Use just about anyplace you can think of. Home, office, waiting areas, public transport etc. Because it is easy to use it gets used. You won’t be using this for a clothing rack! This can be operated and provide benefit without working up a sweat BUT can also give you a good enough workout that you CAN sweat if you choose to work harder. Not a heavy duty exercise machine. If used for more than 15 minutes at a higher tension, the friction causes the unit to heat up. If your desk has a lower keyboard tray there may not be enough clearance to use under the desk. Will get “jerky” at higher tension settings. Hi Doug – I don’t have one that changes the ROM but there is a Stel’Air Folding Pedaller that you can adjust to increase or decrease the range of tension. 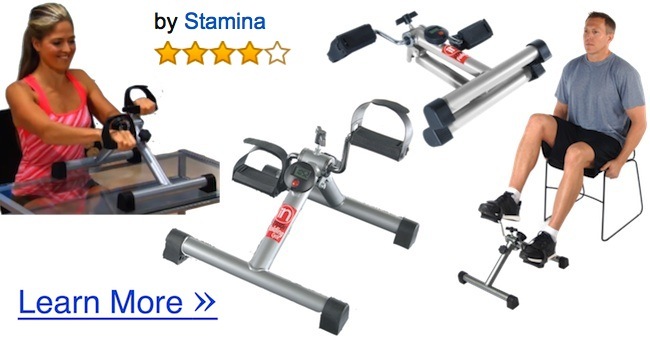 I am interested to know more about the pedal exerciser you are looking for. Do you have any pictures?